A few months ago, when I was replenishing my henna, indigo and zizyphus stash from Mehandi.com, I decided to order some cassia from too. I’d been wanting to try it for a while as an interim treatment between hennas, because it is supposed to have many of the same conditioning benefits sans the time-consuming and messy process! There is NO such thing as neutral henna or blond henna! Much of what is sold in boxes called neutral or blond (sic) henna is Cassia Obovata, usually with unlisted adulterants. Cassia obovata will make damaged hair silky, thick, lustrous, and helps keep your scalp healthy, just as henna does. This has a golden yellow dye molecule, but it won’t show up on your hair unless you are very pale blond (sic) or gray. Cassia will not make dark hair golden. Cassia will make gray or blond hair golden. Those who don’t want the red color that accompanies henna may be interested in cassia as it provides many of the same benefits, without the deposit of the red dye (lawsone) molecule. It also isn’t supposed to cause the curl loosening that is a potential side effect of henna. That being said, it’s the deposit of the red dye that provides much of the strengthening, thickening and shine-enhancing benefits of henna. Henna is a plant resin that bonds to the keratin in the hair strand, carrying the pigment with it and filling in rough spots in the cuticle (hope that I got that right ;)!). Cassia is a different plant and though it coats the hair with a plant resin as well, it is not as strong. Therefore, the effects of cassia only last about 1-2 weeks, whereas the conditioning benefits of henna lasts 3-4 weeks and the color is permanent. However, preparing, applying and “marinating” cassia is far less time-consuming as it only needs to “sit” for 30 minutes and be left on the hair for 30 minutes to an hour. No gloves or bathroom protection are necessary either!! Now that we got that out of the way ;), on Sunday I debated doing a cassia treatment. But, I was persuaded to go for it on my Facebook page (see here :)). I had applied a pre-poo mix of Aubrey GPB and Honeysuckle Rose conditioners mixed with Vatika Oil on Saturday. I’d previously read the instructions to apply cassia to dry hair, but after searching around a little, found that some applied it to wet, washed hair as well. So, I knew that I was okay to wash my hair first. During the same search, I also found that there are different cassia recipes just as there are for henna. So, I decided to make a pseudo cassia gloss using the same ingredients that I use with henna, with one exception. I used warm filtered water instead of green tea as adding an acid to cassia releases the yellow dye molecule. That isn’t a problem for my dark hair, but it might have caused my grey roots to yellow. No bueno. Mixed 100g cassia powder with approximately 1 cup of warm filtered water and let it sit for about 30 minutes. 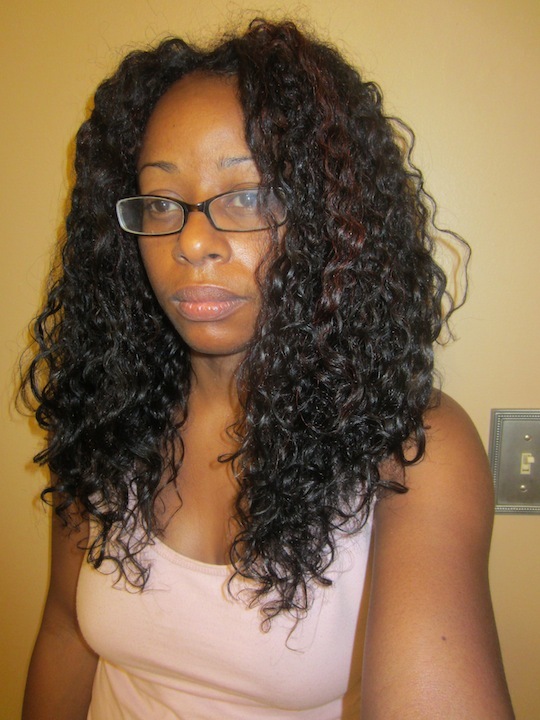 Hopped in shower and shampooed hair in 6 twists with diluted DevaCare No Poo (diluting No Poo provides it with nice slip). Released each twist to lightly finger detangle and re-twisted before rinsing shampoo (20-30 min.). 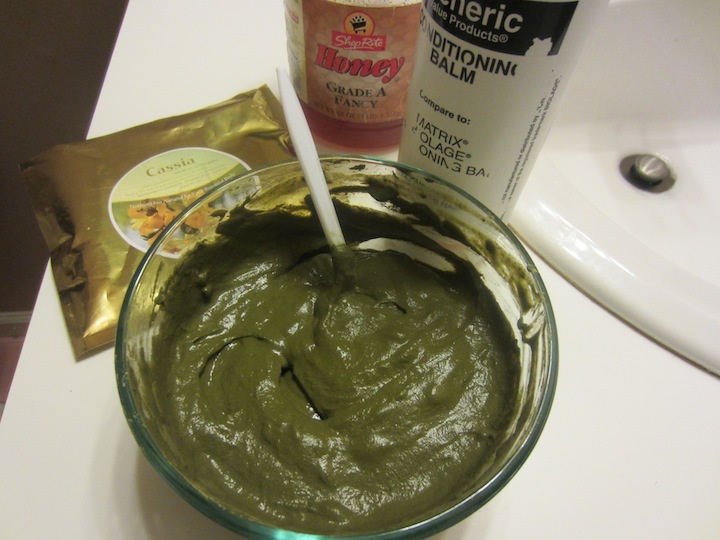 Got out of shower and mixed about 1/2 – 3/4 cup Sally’s GVP Matrix Conditioning Balm and 1/4 cup of honey into the cassia mix. Applied cassia mix to hair in sections, smooshing it on scalp and through length to thoroughly coat strands. Piled hair on top of head, wrapped it in plastic wrap and put on a plastic baggie. Donned Hair Therapy Heat Wrap for 1 hour. Hopped back in shower, rinsed and finger detangled with loads of Herbal Essence Hello Hydration (HE HH). Threw in some Suave Naturals Tropical Coconut conditioner too (just to use it up; won’t be repurchasing as it gives me no slip. I’ve been taking CurlyNikki’s advice and using it for shaving though ;)). 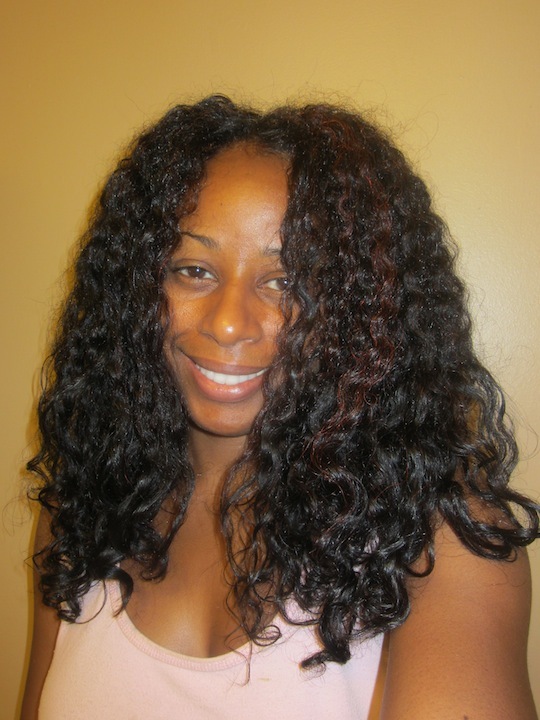 Deep conditioned in 6 twists with Darcy’s Botanicals Pumpkin Seed Moisturizing Conditioner (1 hour w/heat wrap). Rinsed DC under tub faucet using Cool and Seal techniquewith diluted HE HH. 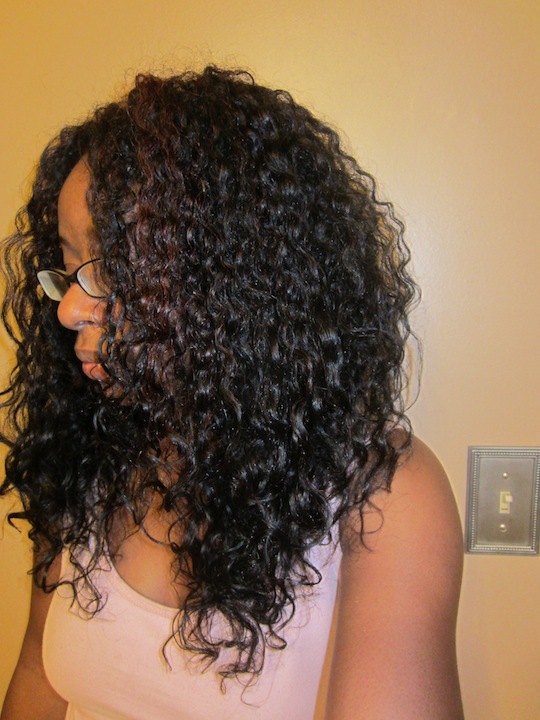 Styled WnG with Sheilo Leave-in Protecant and Jessicurl Confident Coils Styling Solution using Rake & Shake technique. My hair was still damp when it was time for bed, so I put it in a pineapple, made one big loose twist and formed a loose bun by securing the ends with a jaw clip. This morning, I released the bun to find my hair still damp. But, I used a little Wonder Curl Polishing Pomade to smooth out a little bit of the crunch anyway. Excuse my “I just woke up” face please ;). Overall, I think this cassia treatment worked out well!! As expected, it was a lot easier and far less time-consuming than henna. It had a similar grassy smell, but that doesn’t bother me. I also got the same level of shine and smoothness that accompanies a henna treatment … unfortunately for me, that seemed to still be accompanied by curl loosening!! What the heck?? This is NOT supposed to happen with cassia! Okay, okay. I suspect that this may have to do with how much I conditioned my hair during this process … pre-poo, conditioner in the cassia, conditioner to detangle, deep condtioner. So, I’m hoping that my curls will bounce back with some protein-instilling Aubrey GPB conditioner (sans the Honeysuckle Rose mix) and another wash. But again, my hair looks and feels pretty good! In addition to being shiny and smooth, it feels very clean, light and fluffy. Depending on how my curls bounce back after my next wash session, I definitely think I’ll try cassia again in another month or so. Shoot, might as well … I have another bag of it ;)! Plus, the results are supposed to wear off after a week or two, so I really don’t expect the curl-loosening to be long-lasting or permanent. Since the whole process is so much simpler and shorter than henna with similar results, I’d definitely recommend it to anyone contemplating henna, but who is hesitating because of the color or time concern. UPDATE: My curls did bounce back the following wash day. So, I’ll definitely try cassia again! Do you use cassia? What’s your mix? What kind of results do you get with it? That’s what happened to me as well, the curl loosening that is. I tried it twice and both times noticed curl loosening so i stopped. I really like my curl pattern and since cassia loosened my curls some I’m a little scared to try henna. Mahogany, I didn’t think cassia would loosen my curls!! Did yours revert after you stopped using it? If so, how long did it take. I was assuming that mine would come back next wash day!! Yeah, I definitely wouldn’t try henna if cassia loosened your curls … especially if they didn’t revert! I welcome the curl loosening, my curls shrink really tight. I have used henna but yet to try cassia. The thing is Ang … it seems henna loosens the curls of those of us who don’t want loosening and does nothing or tightens the curls of those who want theirs to loosen!!! Isnt’ that always the way of it?? Have you ever tried a caramel treatment? I’ve read that it can soften and elongate curls. I have tried cassia before and have really like the results. However, I missed the color of the henna. Miche’al, you know with this grey, I’m not giving up my henna;)! This was just something to try in between henna sessions:). Also, good fodder for the site:)!! Great post! Do you know if cassia is sold at the Indian store? It looks beautiful Shelli. You may be onto something with the loosening coming from all the conditioner. Do you plan to use the same process next time? How did the cassia look on your grey hair? was it something that you deal with? I’m asking because I have alot of grey around my hairline. DblDee, I didn’t notice any color on my grey really. I didn’t have much new growth, but I also didn’t allow the cassia to sit long enough for dye release. From what I read on Mehandi.com, it seems cassia is similar to henna in that full dye release happens when it sits for several hours. So, my grey still looked grey. I continue to henna/indigo now to cover my grey hair and started using the Touch Back marker in between treatments to cover visible roots at my part and temples. Yeah, I really want to try henna but I have grey and I actually love my grey hair and don’t want the color. Is the cassia something I should try? Hi Hope. Cassia will actually make grey hair turn yellowish, unfortunately. So, it is not a good option for grey hair. I’m trying to remember if there is an option for grey hair, but can’t think of any off of the top of my head. I do have a post on here called Color Options with BAQ Henna or something like that. If you want to check it out, you can just use the search in the right hand navigation and should be able to find it.